What is it? ChatCircles2 is a graphical chat room where, instead of avatars, participants use color and form to convey social presence and activity. This is a research project that started in 1999. 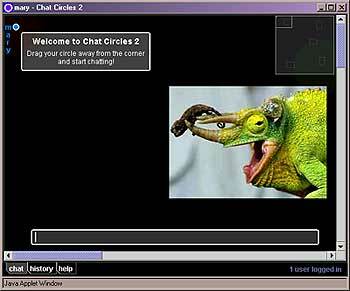 It is called ChatCircles2 because it is also a major revision of the original ChatCircles interface. It introduces three new elements: images in the background, action traces and a map of the entire space. You choose a username and a color and that automatically connects you to the server and places you in the chatroom. You may choose any username you like. No password is necessary to enter the chatroom. When you first enter the chat room your circle is displayed in the upper left-hand corner of the screen. A written message appears next to your circle asking you to move out of the corner in order to start chatting. 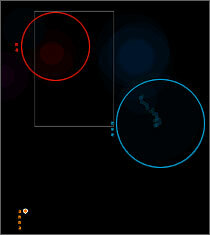 To move yourself, simply click on your colored dot, hold down the mouse button and drag yourself around. The chatroom is much bigger than what appears in the initial window, you can explore the rest of the room by moving yourself around or by expanding the chatroom window. To speak, simply start typing and you will see your message displayed inside the message bar at the bottom of your window. . Once you hit the ENTER key, your message will be posted inside your colored circled so that other people in the chatroom can see what you said. When you post a message, your circles grows to accommodate the text. Your circle will display your message for a few seconds then it will shrink again to its original size. In ChatCircles, every user has a "hearing range". This means that you can only "hear" (i.e. see) the messages of users who are inside your hearing range, that is, users who are visually close to you on the screen. If a user is so far away from you as to be outside of your hearing range, you still see their circle, and you still see their circle growing when they post something; but you do not see the text of the message they posted. In order to do so, you need to move your circle closer to their circle. This proximity-based filtering is used to break large groups into conversational clusters on the screen, giving each user a personal view of the chatroom space. ChatCircles keeps a graphical log of conversations in the chatroom. To get to the log, simply click on the "history" button at the bottom of the chat window. Each user's activity is shown as set of lines over time, with the user's name on top of it. The action traces show where participants have been and the places where they have spoken. 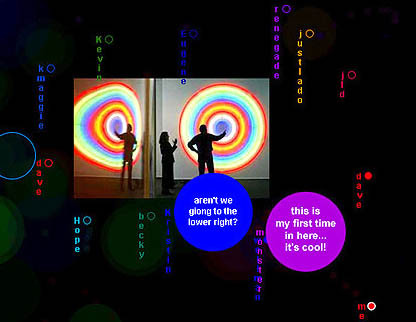 Users’ movements and conversations color the space, making all activity into an expressionist sketch. As you move around in the chatroom you leave movement traces behind you. These traces are ephemeral and disappear rapidly. Here is a GALLERY of the traces left by users; these are beautiful images created by people as they interacted in ChatCircles2. On right (or left) upper corner of your ChatCircles2 window, you will see a map of the entire chatroom. 1. the chatroom is much bigger than your viewing window, so the map shows you how much of the entire room you are actually seeing at any given point. It also shows you where your viewing window is placed in relation to the rest of the room. The background of ChatCircles is punctuated with pictures that are updated frequently. Most of these pictures come from Yahoo's most popular content page. The pictures are frequently updated and, sometimes, you might find that all of the pictures in the chatroom refer to a common theme. Each picture has a "viewing range", which means that, in order for you to actually see the picture, you need to be within its viewing range. If you are outside of its range (i.e. too far away from it), you will see the outline of the picture. The images on the background introduce topics for conversation, helping to define the space as a social environment. Check out the ChatCircles2 Gallery! 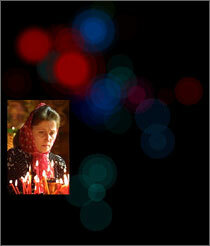 Here you will see some of the beautiful color patterns created by users as they interacted in the chatroom. Please refer to our FAQ (frequently asked questions) if you encounter technical problems.